Gordon Moore’s 1965 prediction of continued semiconductor device down-scaling and circuit up-scaling has become a self-fulfilling prophecy in the past 40 years. Open source code development and sharing of the process modeling software SUPREM and the circuit modeling software SPICE were two critical technologies. Can we duplicate such multi-disciplinary software development starting from teaching and research in a small research group leading to true economic impact? What are technologies that might advance such a process? How can we deliver such software to a broad audience? How can we teach the next generation of engineers and scientists on the latest research software? What are critical user requirements? What are critical developer requirements? What are the incentives for faculty members to share their competitive advantages? How do we know early on if such an infrastructure is successful? This presentation will show how nanoHUB.org addresses these questions and will discuss quantitative impact studies on education and research through nanoHUB. GERHARD KLIMECK is the Director of the Network for Computational Nanotechnology and Professor of Electrical and Computer Engineering at Purdue University. He was previously with NASA/JPL and Texas Instruments leading the Nanoelectronic Modeling Tool development (NEMO). His work is documented in over 340 peer-reviewed journal and proceedings articles and over 190 invited and 340 contributed conference presentations. He is a Fellow of IEEE, APS, and IOP. President John Ingersoll called the 2,313th meeting to order at 8:26pm February 22, 2012 in the Powell Auditorium of the Cosmos Club. Mr. Ingersoll announced the order of business and introduced two new members of the Society, including the speaker of the evening. The minutes of the 2,312th meeting were read and approved. Mr. Ingersoll then introduced the speaker, Mr. Gerhard Klimeck of Purdue University. Mr. Klimeck spoke on "Web Platforms for Collaborative Research and Education: The Quantifiably Positive NanoHub Impacts." 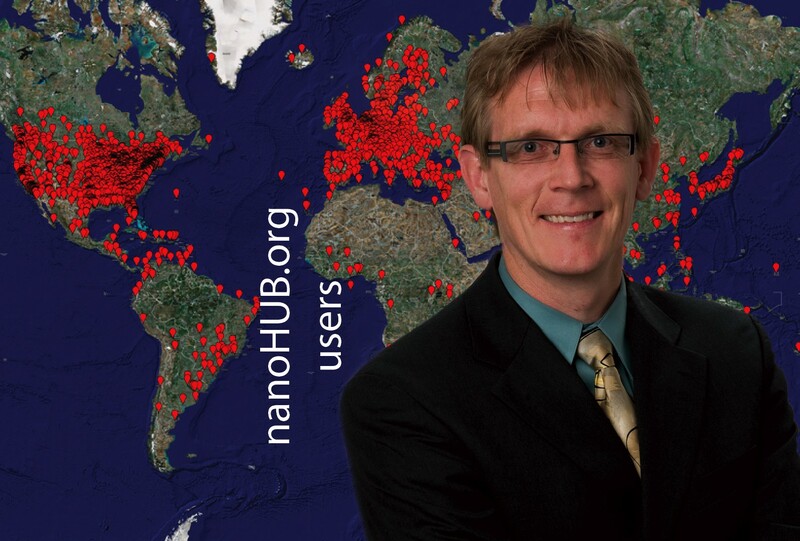 Mr. Klimeck began by introducing the nanoHUB website, an online science gateway that helps users explore the field of nanoscience, download educational resources, watch lectures by leading researchers, and access powerful simulations that offer intuitive controls, extensive documentation, and easy visualization of results. NanoHUB provides access to these simulations for free, requiring only a simple user registration process. Mr. Klimeck believes that these features can be quantitatively shown to facilitate scientific knowledge transfer between researchers, academia, and industry. Mr. Klimeck explained that there were two major inspirations for nanoHUB, the Berkeley SPICE circuit design tool and the Stanford SUPREM process simulation tool. SPICE began as a teaching tool between a single professor and student, became an early open source project, and evolved into an industry standard used to optimize device integration. Stanford SUPREM was later developed and followed a similar growth path, spreading to industry usage and used to reduce device size. Moore's Law is often discussed in terms of device integration and device size, so Mr. Klimeck believes the availability of SPICE and SUPREM were critical in the birth of an industry now worth almost three hundred billion dollars. NanoHUB was created with the hope of applying this model to research in nanoscale structures spanning scientific fields such as electronics, materials, photonics, mechanics, and biology. Mr. Klimeck explained that nanoscience research basically consists of both experimental and computational work, but explained that a practical barrier often exists between the two and that it would be beneficial to allow experimentalists, as well as classrooms and industry, easy access to live simulations. Breaking this barrier of access has been attempted before without much success, but he believes nanoHUB has solved some of the intrinsic problems by focusing directly on the needs of both suppliers and consumers in this new marketplace of simulation products. Suppliers such as computational scientists would need developer-friendly ways to make their simulations available and consumers such as experimentalists, classrooms, and industry would need friendly user interfaces and documentation, he said. Mr. Klimeck focused on supplier problems, noting that most research code is written by one user for one user. This code tends to lack a graphical interface and consistent documentation, often just a few people in the world really understand it. Past efforts to place simulations online have usually involved hiring a web developer to rewrite the simulation in a web-friendly language, often taking 2-3 years and always lagging behind the continuously updated research code. The web developers must be paid, sometimes costing hundreds of thousands of dollars, and after the project has been completed it could be noted that no new research has actually been done with that significant investment of time and money. Mr. Klimeck explained that nanoHUB has written custom tools that eliminate many of the listed bottlenecks, enabling researchers to post their own simulations with only about two weeks of effort and without requiring a rewrite of the code. NanoHub provides researchers a development workspace directly in their web browser, software repositories, easy ways to connect to high-performance computing resources, staging and testing areas, and publishing ability, with official support at each step. The resulting simulation tools are registered, created, uploaded, installed, approved, and finally published, connecting suppliers to customers. Mr. Klimeck noted that this approach really works, with nanoHUB now providing 260 tools with over 1400 revisions and over 300 developers, mostly volunteer. He believes there are direct, significant advantages for developers who make simulations available through nanoHUB. He provided an example of a researcher that has posted 17 tools, which have been cited 123 times and served over 11,000 users, and another example of a researcher that has published 8 tools and received an early tenure promotion partly due to his integration of nanoHUB tools into his research, existing classes, and a new nanoelectronics curriculum. Mr. Klimeck explained that analyzing tool usage logs allows nanoHUB staff to classify users by their behavior, such as classroom usage, experimental researchers, computational researchers, and self-study users. He noted that in the 2009 academic year, they identified 116 courses at 97 institutions with a total of 2,100 students. He believes this demonstrates that it is possible to easily transition research code directly into the classroom. Twelve years of usage logs show that most tools begin as research tools and are then adopted by classrooms, but that the opposite migration does also occur and this is reminiscent of SPICE and SUPREM. Further, the median adoption time between tool publication and its first use in a classroom is 5.7 months, compared to an average textbook update cycle of 3.8 years. Mr. Klimeck noted that research papers cite materials used, which sometimes includes nanoHUB tools. NanoHUB has identified 960 such citations, of which 35% involve experimental data and 14% of authors are primarily experimentalists. Of the over 1600 total authors, 77% are outside the Purdue Network for Computational Nanotechnology and 9% of authors are primarily affiliated with industry. Mr. Klimeck believes this is proof of voluntary use by all kinds of customers, not just computational researchers. Further, nanoHUB's 960 direct citations have over 8000 secondary citations, with an effective h-index of 45, demonstrating that the research being produced using nanoHUB tools is of very high quality. Mr. Klimeck concluded by looking to the future and imagining that nanoHUB could extend to experimental data, potentially allowing a researcher to click on a graph in a publication and be taken directly to the tool that generated that data or the original experimental dataset. He hopes to do so in all areas of nanoengineering and nanoscience, providing personalized learning experiences and becoming part of the day-to-day workflow for scientists. In this case, he believes nanoHUB may eventually transform into a new kind of professional society. Someone wondered how simulations are made accessible over the Web without reprogramming them. Mr. Klimeck explained that nanoHUB has produced a software wrapper for simulation input and output data, which can be learned in a few days and can automatically generate a web-based user interface. The simulations are always run in their native language and execution environment, he said. Another question concerned simulation data handling and storage. Mr. Klimeck clarified that few tools generate large amounts of output data and that it is often discarded when a user is done. However, he is interested in archiving and cataloging simulation data, perhaps avoiding the need to recompute results from the same input parameters or mapping the exploration of parameter space. He believes enhanced data storage capabilities would suggest many interesting opportunities and some very non-trivial problems. After the question and answer period, Mr. Ingersoll thanked the speaker, made the usual housekeeping announcements, and invited guests to apply for membership. At 9:59pm, President John Ingersoll adjourned the 2,313th meeting to the social hour. ← What Do We Really Know About Economic Growth?